Safa has worked in the veterinary field for over ten years and brings extensive experience in specialty referral medicine to Animal Dermatology and Allergy Specialists. Safa has worked with Riverdale Veterinary Dermatology for over eight years and possesses a wealth of knowledge in the area of business administration, office systems management and client communication. Safa holds an associate's degree in business from Berkeley College. Safa is not only responsible for office administration, but functions as a liaison for communication between the client and medical staff at ADAS. She is a wizard with computer programs and has formulated many of the documents in use at both hospital locations. Elizabeth (Liz) has been a veterinarian technician for over 17 years. She has an associates degree in medical laboratory technology (MLT) and has advanced training in phlebotomy. Liz arrived at Riverdale Veterinary Dermatology in 2012 with the highest praise from her previous employers. She was characterized as "diligent, trusting, dedicated, hardworking, motivated, focused and reliable". We completely agree. Her demeanor and positive attitude mirror her skill as a medical professional. Liz enjoys listening to live music, container gardening and long motorcycles rides. She has a lifelong love of fostering baby animals and owns 8 "rescue" cats. Nicole graduated from Bergen Community College with an associate degree in veterinary technology, applied sciences and health and received her license in veterinary technology in 2013. Nicole combines her skills as a veterinary technician with compassionate care delivered to every patient. When not at the office, she enjoys watching hockey and spending time with her two cats, Pickles and Relish. 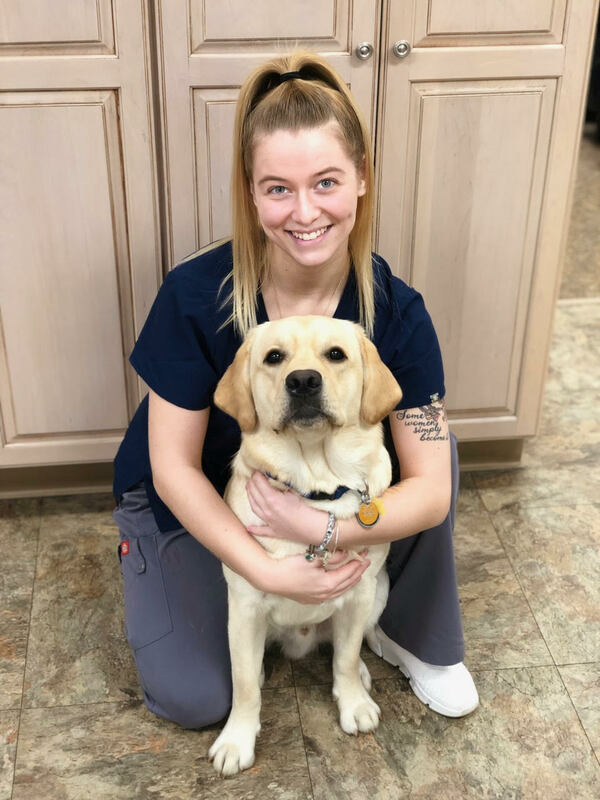 Laura completed her veterinary technician certification from Bergen Community College in 2013 and takes great pride in her work at both the Riverdale, NJ and White Plains, NY office locations. Her excellent communication skills reflect our goals of exceptional client and patient care. Laura keeps us all laughing and enjoying each day with her upbeat attitude. She is very adventurous and even loves to sky dive! When not road tripping across the country, you can find Laura singing in her church choir or hiking with her dogs, Heidi and Teddy. Garrett has been working as a veterinary technician for three years and is currently enrolled in the Penn Foster veterinary technician program. He is originally from South Carolina and started working with animals at the age of 14! Garrett's brings enthusiasm and a positive attitude to the office each and every day. When not at work, Garrett enjoys hiking with his Jack Russel mix, Scribbles, running Spartan runs, traveling and playing the harmonica. Kristin started her veterinary career nearly ten years ago while working as a veterinary assistant and receptionist at a general practice in New York. She graduated with a bachelor's degree in biology and a minor in chemistry from Utica College. One of Kristin's many strengths stem from her previous experience in a multi-specialty hospital where she honed her skills in dermatology, surgical nursing, ICU and emergency medicine. She is currently completing her associates degree in veterinary technology and works at both the Riverdale, NJ and White Plains, NY office locations. When not working, Kristin enjoys baking, beach trips and photography as well as spending time with her dog, Cato, and cat, Oakley. Prior to joining the ADAS staff, Samantha (Sammy) obtained her license in cosmetology and worked as a professional hairdresser. Sammy's love for animals brought her to RVD and this is evident every day! Sammy is one of the first people you will meet when visiting our office and she is always courteous and patient. She currently resides in Warwick NY with her husband, Billy, and their two dogs, Layla, a West Highland white terrier and Hooper, a Cane Corso. When she is not at work, Sammy loves to spend time outdoors hiking or just relaxing. Born and raised in Wayne, New Jersey, Chelsea has been working in the veterinary field for over 5 years. She is a certified vet assistant from the Animal Behavior College. Chelsea loves spending time with her 2 dogs- Riley and Rosie, and her cat named Bird.